This article was written by Holly Shayler, published on 2nd September 2014 and has been read 4172 times. Holly Shayler studies Geography and Spanish at the University of Leeds and spent her year abroad as a language assistant in A Coruña. She has been blogging about her experiences but here she shares her top ten tips for getting the most out of this little-known Spanish city! 1. There’s no place like home! 6. What is this strange language? When I was given A Coruña for my year abroad my first question was…where?! A current student of Geography and Spanish at the University of Leeds, I had applied for British Council in Andalusia and ended up with Coruña…in the far north! There’s so much more to Spain than Seville and Barcelona and this year could be your chance to find it so if, like I was, you are feeling clueless, have a read of my top-ten pointers and then sigh with relief. Check out websites such as Mil Anuncios, Piso Compartido and Idealista and don’t be afraid to go visit properties with no picture online, that’s how I found mine! In the city centre around Plaza de Pontevedra and Calle Estrella you are within minutes of tapas bars, clubs and the beach. Walk 15 minutes and you are at Cuatro Caminos, home to both the train and bus stations as well as to the famous Estrella Galicia cervecería. Monte Alto is also home to many bars and the Old town, but can take a while to get to the stations and the stadium. All areas have a plentiful supply of supermarkets, cafes and bars and available apartments are in excess in the city so WAIT until you get there to sign. For a quality apartment room expect to pay between €120-180….a month! An umbrella, waterproof coat and wellies. In the summer this area is lusciously green with amazing beaches, but unfortunately you have to put up with coastal storms and torrential rains through the winter. But don’t give up as there is a very bright light at the end of the tunnel! For all those home essentials head to the Marineda shopping centre on the number 11 bus to visit Ikea. The main beaches Riazor and Orzan are a given but take a bus to the nearby Santa Cristina or Bastiaguiero and try a surfing or paddle-board class. Coruña is full of stunning viewpoints. 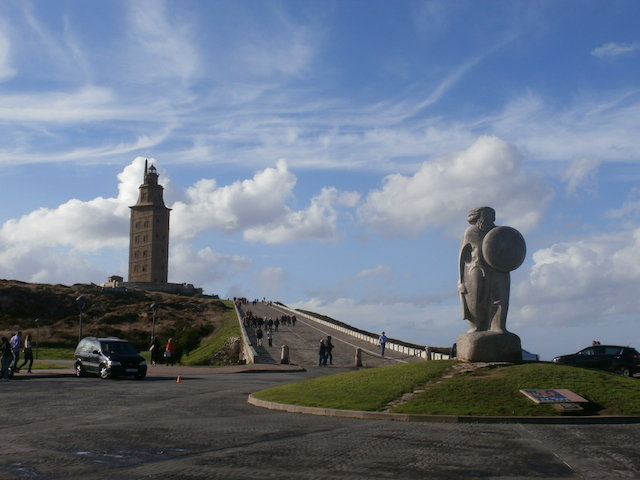 Go to the famous Torre de Hercules lighthouse, free to climb on a Monday, and admire the headland rimmed with a variety of art from a giant conch to a Stonehenge lookalike! On the opposite side of the bay stands the amazing San Pedro hill from which you can see the entire city. Have a BBQ on one of the many BBQ stands or watch the sunset whilst sitting on a replica canon! In the evening the place to be is Calle Orzan. Busiest with students on a Thursday and Saturday, this street is literally lined with bars, usually with free entry. Afterwards make a slightly gruelling trek to the club Moom before 4am if you want free entry or alternatively go into the old town to visit the bars on the cobbled streets. Go into the Plaza de Pontevedra branch of Novagalicia and bag yourself a bus card. This top-up card gives you 80 cent journeys - including the 20 minute journey to the airport - and discounts on the longer journeys heading out to towns and beaches along the coast. However, on a nice day you can easily walk around the entire city. When it comes to food you are in for a treat! Galicia has the best seafood in Spain and I can certainly vouch for that! Although you won’t find paella, octopus, mussels, squid and barnacles are the local dishes and are delicious and above all….cheap! Go to recuncho de mayte in the city centre or cervexa in Cuatro Caminos for cheap but tasty tapas starting at €1. Don’t forget to try my personal favourite local dish: raxo (order and find out what it is!). So here’s a nice surprise about Galicia, they have their own language! Like Cataluña, Galicians have their own version of Spanish which sounds more like Portuguese but DO NOT PANIC. Everyone speaks Castellano, the accent is very clear to understand and it’s a good chance to learn yet another language! The best thing I could’ve done for my language learning was living with Spaniards. Being forced to speak Spanish when at home will majorly improve your language skills but just be sure to have the Word Reference app handy especially when watching Spanish TV or reading labels at the supermarket! As Galicia is so untouched by Brits it means there’s plenty of teaching work to go around. My students all found me whether through teachers at my school or word of mouth but others used the website Tus Clases Particulares. Don’t charge less than €10 an hour and if the lesson needs lots of preparation then €15 is very reasonable - don’t let pesky parents tell you otherwise! All the material you need can be found online and sign up to Busy Teacher for useful worksheets and games. There are so many Auxiliares around and about so make an effort to find them! The facebook groups for Erasmus Coruña and Auxiliares de Conversación are very active and a good way to make friends of all nationalities. 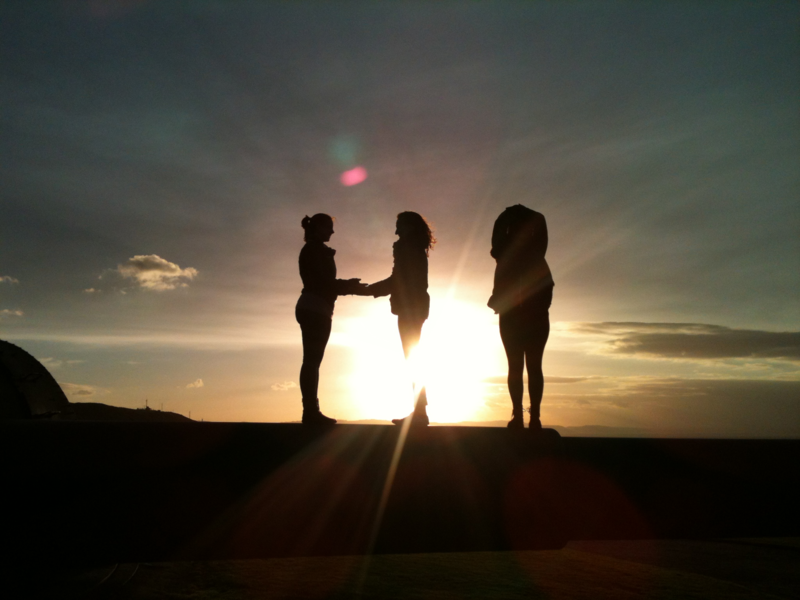 The Coruña Erasmus group also offer fun nights out and cheap trips to Spanish and Portuguese locations so get involved! For the job itself, remember to take pictures and postcards of your home and uni towns for show and tell. Spanish children are OBSESSED with 1D so, even if you are not a fan at all, take some fan merchandise and they will love you instantly! DON’T FORGET to do your NIE as soon as you get there! Head to the police station located at los Jardines with your contract, passport and address. You are then given a form that needs stamping by a bank (cross the road to find them all in a line!) and then you have to go back to the station again to give in the form and get your card a few days later. It can be an arduous process so my best advice is to wake up early and go at 9am when the oficina de extranjeros opens and print and fill out a NIE form before you go…I wish I had! Once you have this you can set up a bank account and most importantly get paid! Perhaps the most important point of all! Take advantage of the cheap transport to visit surrounding towns along the coast such as Vigo, Islas Cies, Muros and the many many beaches! Galicia is also a surfing mecca so try a few lessons for ridiculously cheap prices (I learnt with Base Camp Surf, but Vazva are also a reputable company). Coruña is an amazing city to spend your year abroad so have fun and get exploring!